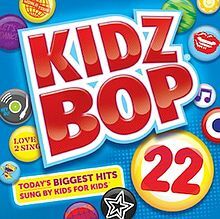 A Borderline Mom: Kidz Bop 22 is available today!!! Kidz Bop 22 is available today!!! I have a confession to make... *whispers* I listen to the Kidz Bop CDs when my kids aren't even in the car. If you tell anyone, I'll deny it! Here's what's great about Kidz Bop- they magically churn these things out while the majority of the songs are still in high rotation on the radio! So my kids recognize the song and can sing along. They are quite heavily edited, which does make me chuckle with how they change the wording, but that's okay because my kids don't need to be asking me what this or that means all the time. Also, it's nice for me because they are songs that I really like (sorry, but not Justin Bieber). Somehow you can have 6 radios on your pre-set and they all have commercials or cruddy songs, so sometimes I turn it back to Kidz Bop. Aaaand, it makes road trips more tolerable for the kids. Long story short, Kidz Bop 22 is out today! Although I've been enjoying it for weeks (eat your heart out), you can now enjoy it for years to come! The Many Uses of Ivory!